Side Rib Detail: Side rib detail offers an expanded, spacious surface for food items to rest upon and helps keep the container shape compact. Perforated Hinged Lid: For storage purposes, the clamshell container’s one-piece hinged lid eliminates any lid confusion which improves overall operational efficiency. For convenience purposes, the perforated detail encourages sharing of delicious food by providing a clean even cut between lid and container. Secure Snap Locks: Secure snap locks ensure full container closure as well as a fun audible snap when fully closed. They’re pretty great – if we do say so ourselves. While we carry clamshell containers in a variety of materials, our most recent clamshell container addition boasts a USDA food approved PET plastic composition. It has a crystal clear surface which allows for pre-packaging with an upscale appearance and product visibility. It’s also strong, lightweight, and shatter-resistant. Check them out here! 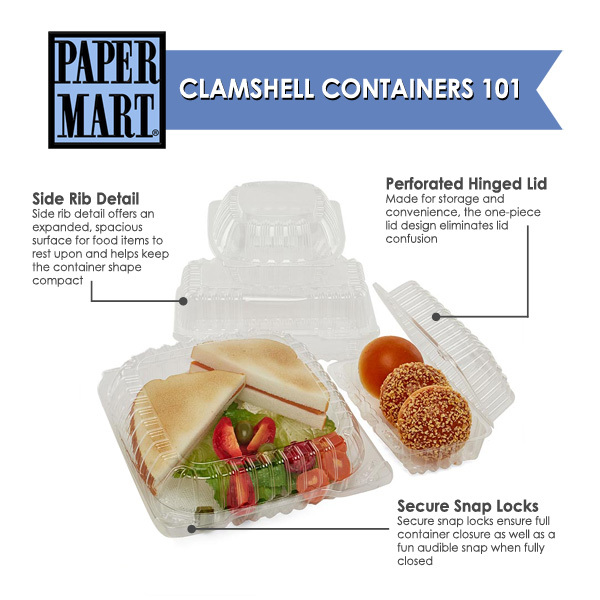 Package your meals safely using clamshell containers. Share your restaurant packaging with us using the social tag, #mypapermart. For more creative ways to personalize your business, stay tuned to our blog for tips for small businesses, product features, DIY craft videos, and more!